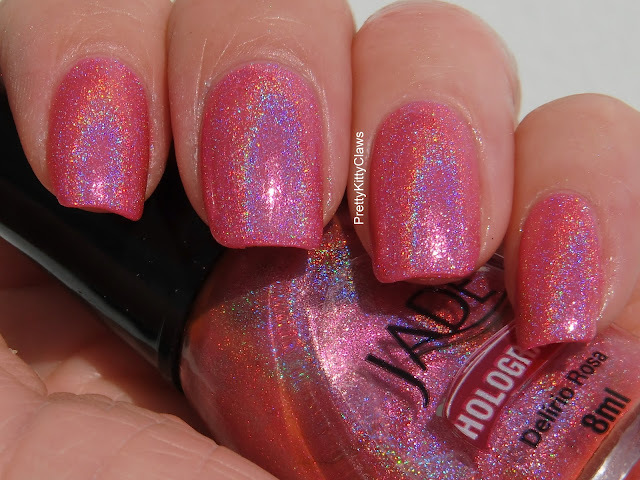 Today it's Jade Holographic Delirio Rosa. This is a gorgeous bright pink strong linear holographic polish. I was lucky enough to get this in an awesome swap with a lovely lady from Brazil and I really enjoyed wearing it. The formula was great, this was 2 coats and the holo effect wasn't dulled by a topcoat at all. The pictures don't really do this holo justice, it was a lot more holo than I could capture but it's pretty in these pictures anyway so enjoy!! Jade is stocked by Llarowe and Ninja Polish.